The gym app, the yoga, the hair cut app, the restaurant app, the travel app. Reserve with Google (RwG) is becoming the all-in-one app, freeing users to book activities directly through Google’s Search and Maps features. How? By consolidating a fragmented landscape of third-party enterprise scheduling, booking, & software providers. RwG now has 64 existing and pending partners slated for integration. This includes many of the core traveler-focused players that recently got acquired or funded. Traveler-specific products are just one part of it. Any service that requires an appointment or reservation is opening up to receive bookings from Google. This takes search to a new level. Credit where credit is due. RwG will transform Google Maps into a TripAdvisor on steroids. With RwG, Google combines local search with customer reviews and bookings. The digital ad giant is indirectly going after more ad revenue by creating a superior product to Yelp, FB, or Tripadvisor. Consumer habits are hard to break. Using Google to book appointments at home will transfer over into booking behavior while traveling. RwG will open up new supply for travelers by connecting to inventory found on other apps like Eventbrite and MINDBODY - two publicly traded companies. RwG will eventually connect local businesses to Google’s core applications including Search, Maps, Google Assistant (voice), and Google Pay. This will further strengthen Google’s positioning with travelers. The travel industry uses different naming conventions to talk about tourism activities. Some refer to them as tours and experiences, or attractions. We use the more inclusive term online bookable activities or bookable activities for short, to describe the overall trend. Tours are activities; experiences are activities; attractions are activities. So are haircuts, massage appointments, music venue tickets, local events, and yoga sessions. Google’s involvement in the bookable activities space will grow the local supply that is visible to travelers. Technology, in the most generic sense of the word, can transform services into bookable products. Barbers provide a valuable service. A bookable haircut is a product. You can book it and pay for it online, just like you would a pair of scissors on Amazon. This opens the door for third-party distribution channels. It also enables managers to experiment with personalized offers and pricing, inventory management, demand forecasting, etc. The economics work for the supplier. Incentivizing customers to commit payment upfront secures revenue and increases demand visibility. Hotels and airlines regularly offer differentiated pricing to stimulate demand and to fill supply. Adding new marketing and distribution layers can drive new business. It can also increase operations costs. Google hit a sweet spot by attacking the fragmented ecosystem of scheduling partners. These players already have agreements in place with local businesses. Currently, local businesses must integrate with one of Google’s scheduling partners in order to participate. This locks in exclusivity on behalf of the scheduler. For example, tour operators that use FareHarbor for back-end tech will connect to Google via FareHarbor. Once plugged in, consumers can search for and book those products through Maps and Google Pay. What Google is doing with RwG is not revolutionary. In a way, they are late to the game on digital booking functionality for local businesses. They have depended on OpenTable for restaurant reservations since 2014. TripAdvisor acquired Viator that year. Seamless and GrubHub were founded in 1999 and 2004, respectively. Many of the scheduling partners that Google is now consolidating launched around 2012-13. The more powerful transformation that Google is now pushing forward with RwG is the integration with Google’s full ecosystem of apps including Search, Maps, Google Assistant, and Googly Pay. Connectivity across the full suite of applications will take time to build critical mass - but, there is really no other competitor out there that can effectively connect all elements. Pushing the needle on local ad spend. Yelp, the television networks, Google, TripAdvisor, Facebook, and other channels all compete for ad revenues with local businesses. While not explicitly confirmed, our view is that Google aims to tip the scales with RwG. Yelp generates roughly 80 percent of its total revenue ($550 million in 2015) through local advertising spend. TripAdvisor charges commission on activities bookings, fees on restaurant reservations, and click revenue on meta ads (CPC) for hotels. Facebook offers a range of different local business advertising options including local awareness ads that engage users within proximity of the space. Google wants a bigger share of this market. The following figure is from Tidings, a digital marketing firm for local businesses. Google controls 90 percent of total global internet searches which means that this distribution curve is largely indicative of how the Google algorithm prioritizes organic search results. Other local discovery players including Tripadvisor and Yelp have been vocal in protest against Google and how the company prioritizes Google ad properties, but also Google generated answers to non-fact based questions. The following videos come from website focusontheuser.eu, a sponsored coalition-driven content initiative set to educate consumers, policymakers, etc. on Google’s search practices. The site claims that over one-third of Google desktop searches contain local intent, and that the positioning of Google local packs largely disregards the third-party ecosystem that has formed around local search. Google’s argument against these claims hinges on what is best for the user and how to get users the most relevant information in the fastest manner possible. Both sides have a point and both sides are ultimately trying to protect their businesses. Maps is becoming Google’s default travel app. Google’s biggest advantage in the travel space is, arguably, its Maps application. Its user base is enormous. Google’s Hotel Finder is oriented around Maps and likewise Google Trips, another Google property that features various planning tools and local discovery options. Google Maps has a key role for in-destination exploration through its search and door-to-door navigation features. Increasingly, Maps offers rich content about local businesses including customer reviews and occupancy. RwG features will become increasingly visible on Maps business properties. 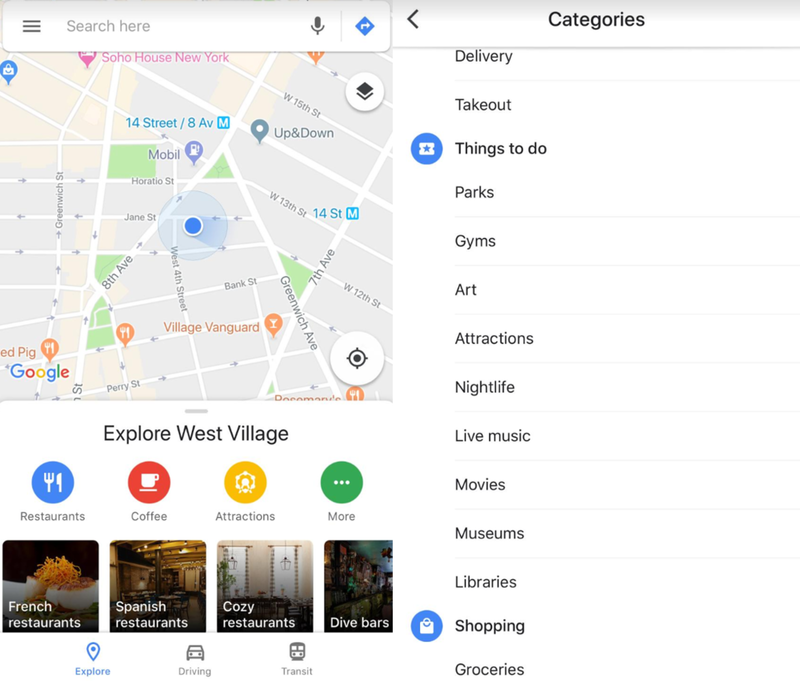 The Explore feature is a new element implemented as part of the overall Maps redesign that kicked off after Google’s I/O conference in May 2018. Google Maps organizes local content into categories e.g. Food & Drink; Things to do; Shopping; and Services. With Maps, Google competes directly with the likes of Tripadvisor for in-destination discovery. RwG will position Google Maps further down funnel as a direct alternative to Tripadvisor. We see how Google would add many more tabs to the Discovery feature. Image: Google Explore Feature. Side-by-side view. Touring Bird, Google’s recently launched metasearch site for tourism activities, is likely a developers’ sandbox to experiment further with eventual integration with Google Maps. The site produces results based on price and content comparisons among various global and local aggregators. Viator (Tripadvisor), GetYourGuide, Eatwith, and various others participate. The likely conflict that Google is likely battling with is price comparison. Touring Bird website, Amsterdam. touringbird.com. Activities suppliers will need a dedicated scheduling partner connecting them to RwG. They also distribute their inventory through multiple digital channels. ABC Tours can appear on both Tripadvisor and on GetYourGuide. The conflict with RwG comes into view as Google Search and Maps gains market share with the consumer. For example, ABC Tours Uses Tripadvisor Experiences as its scheduling partner with RwG. If ABC Tours offers lower rates on other channels e.g. GetYourGuide, then Google would no longer display the best available rate with the RwG connected listing. Through Touring Bird, Google and partners are likely to work through these various kinks. Reserve with Google is expected to eventually integrate with Google Assistant. Voice commands for local commerce make sense. Users will eventually be able to book, let’s say, two passes to the Bronx Zoo. RwG will add rich pricing and product information to Google Assistant’s algorithms and lexicon. This will add critical advantage to Google as it competes with Amazon and Apple. Meanwhile, Amazon holds a dominant position with e-commerce and voice search. The bookable activities space has picked up momentum over the last 12-16 months with new funding rounds and M&A activity within the software and distribution layer of the value chain. Google launched Touring Bird. Booking.com expanded its Experiences product into the U.S. TUI Group acquired Europe based Musement. Peek, a software vendor for tour operators, raised $23 million in funding. There were two back-to-back acquisitions last April: Booking Holdings acquired FareHarbor and the very next day, TripAdvisor announced its purchase of Bokun. Other deals include Mr. and Mrs. Smith’s purchase of SideStory, the sale of Hotelbeds’ destination management unit to TUI, and Marriott’s investment in PlacePass. Take a closer look at the above list of Google’s scheduling partners. Le Forechette, Tripadvisor Experiences, Peek, FareHarbor, and Musement are four partners working almost exclusively with businesses servicing tourists and travelers (Le Forchette is TripAdvisor’s restaurant booking app in Europe). Through RwG, Google could become a powerful distribution channel for these software and scheduling providers. We emphasize that this is NOT a zero-sum game. The recent FareHarbor acquisition, we assume, was motivated in part by Google’s parallel launch of RwG. Booking has taken a different approach with its direct-to-consumer activities business. The company recently expanded Booking Experiences into the U.S. with a big ad campaign featuring pop icon DJ Kalhed. Booking Experiences does not currently offer a customer facing booking engine. Instead, it promotes its product through special offers to existing hotel customers, via email post-booking. Surprisingly, OpenTable is not on the list of RwG scheduling partners. The company partnered with Google to integrate restaurant bookings into the Maps product in early 2014. In June of that same year, Booking Holdings (then Priceline) acquired OpenTable for $2.6 billion. As of September 21st, OpenTable still powers reservations on Google Maps. Growing its tours and activities business is critical to Trip’s long-run success. CPC revenues for accommodations have flat-lined. The company has the dominant lead in bookable activities from a supplier perspective. Viator is Trip’s Reseller and will also plug into RwG. Google competes with TripAdvisor on local reviews particularly restaurants. Online travel. The big picture. Mobile computing quickly changed the business of travel. The iPhone launched just ten years ago. Mobile apps spawned dominant platform-driven businesses. Google and Tripadvisor are true platforms integrating multiple features under a unified and branded ecosystem. Booking and Expedia are becoming platforms. These companies have effectively blanketed the globe with a data layer and universal access to structured information and standardized services. This evolution has opened the door for travel companies to penetrate deeper into local commerce. For the OTAs, full-service is as much about survival as it is about opportunity. The big intermediaries i.e. Booking Holdings, Expedia, and Tripadvisor have steadily migrated over to a full-service platform model, integrating and cross-selling different product categories: flights, traditional hotels, home rentals, car rental, and more recently bookable activities. It’s a double-sided strategy that pits these groups directly in competition or in collaboration with the big platforms. Google holds a dominant position with the traveler. Its ecosystem of apps and access to user data, which it then uses (with increasing effectiveness) for surfacing offers, pricing, ad targeting, and overall cross-promotion of product. The travel brands will not likely catch up with Google on all fronts, but travel is not necessarily a zero-sum game. Google is also a powerful distribution channel for these groups. Travel aggregators carry the supplier relationships. This is powerful because it gives them distribution rights. They also do well with travel consumers, and have reported consistent growth in traffic and bookings. Google chews up a huge portion of OTA revenue used for keywords on search, and CPC campaigns through Google Fights and HotelAds. Reserve with Google will fulfill the same function for bookable activities. For the big travel brands, this will be a two-sided race to control supplier relationships and software. Companies like Peek are likely on the shortlist as acquisition targets. We also see companies like MINDBODY, a fitness booking app, as attractive acquisition targets for the big travel players. This is an opportunity for travel brands to penetrate deeper into local commerce, by acquiring scheduling software vendors with supplier relationships that do not necessarily fit the typical definition of a travel business. Integrating bookable inventory for fitness and sporting activities - for example - is not out of the question. Expect more acquisitions. 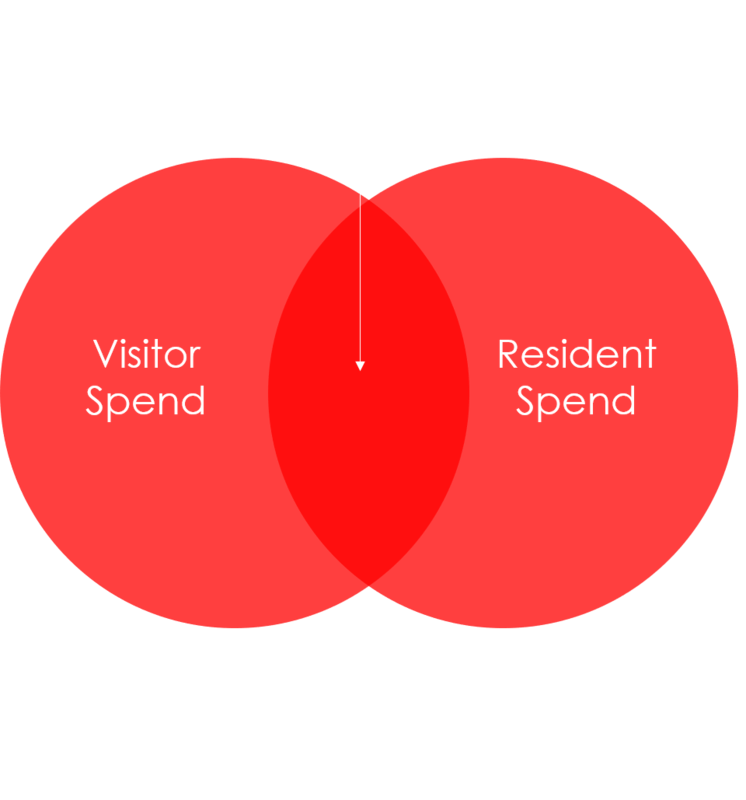 Revenue opportunity with bookable activities. The size of the traveler-focused bookable activities space is significant. Estimates from Phocuswright put the total addressable market at around US$170 billion. Tripadvisor has the most inventory and currently accounts for the largest share of the market, capturing roughly 50 percent of that spend. GetYourGuide follows with roughly 20 percent of the market, according to Skift Research estimates. Figure: Tripadvisor revenue by business unit: Actual and forecasted. *Notes: U.S. Census Bureau Definition on Fees and admissions: Fees for participant sports; admissions to sporting events, movies, concerts, and plays; health, swimming, tennis and country club memberships; fees for other social, recreational, and fraternal organizations; recreational lessons or instruction; rental of movies, and recreation expenses on trips.